Phillis Wheatley was America's first black poet. 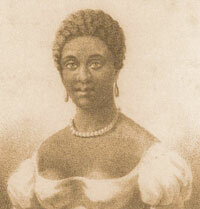 Born in Senegal, Africa in 1753, she was sold into slavery at the age of seven to John and Susannah Wheatley of Boston. Although originally brought into the Wheatley household as a servant and attendant to Wheatley's wife, Phillis was soon accepted as a member of the family, and was raised with the Wheatley's other two children. Phillis soon displayed her remarkable talents by learning to read and write English. At the age of twelve she was reading the Greek and Latin classics, and passages from the Bible. At thirteen she wrote her first poem. Phillis became a Boston sensation after she wrote a poem on the death of the evangelical preacher George Whitefield in 1770. Three years later thirty-nine of her poems were published in London as "Poems on Various Subjects, Religious and Moral." It was the first book to be published by a black American. Most of Phillis Wheatley's poems reflect her religious and classical New England upbringing. Writing in heroic couplets, many of her poems consist of elegies while others stress the theme of Christian salvation. Although racial equality is not a theme to be found in Phillis Wheatley's poetry, one allusion of injustice appears in one of her poems which appears below. To hear the poem spoken aloud, please click on the icon.